Gingerballs, backglass and DOF feedback! now with new guts! Re: RedHead KingPinball aka Gingerballs,2nd screen working and bonus video! Sweet. Can't wait to see the toys you put in it. Just 7 solenoids. I bought an 8 relay USB board and used up 7. Might add another for a knocker. Solenoids are set up to make contact at nearly the end of stroke, keeps the effect from being too powerful for such a tiny pin. I still have a TON of kinks to work out (like why force feedback works on T2 and Comet but not on Elvira or Medieval Madness) but the foundation has been laid! Big thanks to "thagerty" for wiring and config help. I've been so busy adding feedback to my own cabinet, that I've missed this thread. So you were able to get all the solenoids working in DOF? Ideally if you got your config files all sorted out, most tables would be good to go.....as long as you have db2s enabled on each of those tables! Its not a one config kind of thing. You may have to go into EVERY table and change the configuration in the "script" so that instead of using VPinMAME, it uses either B2S, or DB2S, etc.... Its the db2s server that DOF works through to fire your solenoids, so that's why you need to do this. I did it for all of my 150+ Visual Pinball tables! Solenoids work in DOF just fine. I only have 8 tables installed all with B2S running on them. Comet and T2 are my big go to test tables , Cause I have a Comet and I want a T2. Re: RedHead KingPinball aka Gingerballs, backglass screen and DOF feedback! I won't pretend to have the all in one answer here....but for tables that aren't giving you dof, open the script for the table. Try it...if it works then save the table! Some tables may have some right at teh beginning of the script that will change this for you if you change an "option" to a 1,2,3 or 4. Usually letting you pick between VPinMAME, UVP, B2S, B2S not mech sounds. You could also read threads like this, but don't look at me....I probably did things the hard way! Already did all that to get the backglasses working. I think its just an issue with the table version I have. Seems my biggest issue is that I'm still using some older version of VP9 tables and I need to just stick with VPX tables. Just not sure the computer I shoved in the mini pin cab can handle it. Only 1 way to find out! I do use the older versions of tables until a newer VPX version comes out. VPX tables are looking pretty good. Not quite Future Pinball graphics (with BAM new renderer), but still nice! You can always have both old and new. If using Pinball X, just have a sub menu for only older VP9 tables, and another for VPX, etc... That's what I have. Each of the VP versions have different sub menus, (VP9,PM5,VPX), while all of them combined have another menu, as well as all of them showing in my main menu of all systems. Check out VPinball, VPUniverse, and VPForums. for newer VPX tables. If you want the newer Stern (SAM) tables (The Walking Dead), you need to install a newer custom version of PinMAME from VPUniverse that supports that. You will also need to make sure you have the needed roms for those, also from VPUniverse. VPinball and VPUniverse have the newest VPX tables, I find. turns out the issue is, some of the backglasses I use were EXEs. If the B2S is an EXE DOF wont work. One thing you can do for tables that run slow, is to have the B2S "skip frames", etc in it's settings. Also, try running a table WITHOUT the B2S file and see if it runs better. (disable error popups in B2S settings so you can use DOF without a B2S backglass running). If you are using a front end like Pinball X, you can always just have a still picture for the backglass instead of a video or B2S running. Where did you get the solenoids? So i take it this setup only works with Visual Pinball, no future pinball? Future Pinball can only use Led-Wiz to control feedback and lighting (solenoids, RGB light, toys). I have my LED-Wiz control a Sainsmart NON-USB version for my solenoids. Not too many tables have this done already. The Getaway has it, but none of SLAMT1LT's tables have it for example. You "can" have the Future Pinball flippers and some RGB lighting controlled by using a program called DOFFX2. It allows the control of your LED-Wiz outputs by keyboard keys using DOF! I use it for Pinball FX2 and The Pinball Arcade. Look at my Youtube channel or my PinKadia build thread for more info and a demo. No shots of the front end yet, but Im running PinballX. All the tables that werent working with force feedback now are. I had to replace the EXE backglass with a b2s backglass. I went back to silver rails, I just like em better. Updated VpinMAME and my ROMs to include Stern SAM tables. All thats rerally left is to add a ---fudgesicle--- ton of table and maybe improve the hardware inside a bit. Looks great! Love how people come up with mini-pin ideas. MUCH easier to move around that's for sure! I recently just got VPX running in exclusive full screen, which runs soooo much better! It's a bit of a tricky setup, but its so nice seeing those tables with everything maxed out running buttery smooth like it should (I have a gtx 960). If there is a catagory for minipins this year you have my nomination. If not im still nominating in bart tops. So Long time no update. I replaced the old dual core i5 with an i7 870 , the fastest CPU this mobo will support. Turned on Vsync and everything is much smoother and plays much nicer. PhysMod5 tables play but there aren't enough of them I like to bother replacing existing tables. I have enough spare parts to maybe completely replace the PC inside this set up, if so I'll rewire everything and make it much nicer the 8th time around. I'll even put the solenoid drive board in the back glass box along with a free play knocker I did move everything off the laptop hard drive and over to the SSD to both free up some room inside and improve loading times. New computer or old, its going to get upgraded to 8 or 16 GB of RAM as well. Rails were off cause I was moving stuff around underneath the LCD. I need to make or order up some shorter DVI and other wires. Also there is a way to use force feedback in pinballfx2 but it only activates when you press a button. So the solenoids will only fire when you press the flippers or the ball launch. Not ideal but it's a start. Actually, if you have LED-Wiz, now you CAN have FULL Force feedback in Pinball FX2! It's a new WIP program, with only a bunch of tables working (though you "may" be able to just add more tables into the ini file, haven't tried...). Currently it only works with LED-Wiz for now. See there, more reason to keep it. Totally agree. I put micro leafs in my build and I really prefer the lighter feel. Agree. I have the true-leaf, and the micro-leaf from groovygamegear, and the micro-leaf are by far my favorites. Wish ALL my buttons had them! The True-Leaf are great don't get me wrong, but I find they need to be adjusted on occasion, and if you don't have easy access to them in your cabinet, then its a real pain. The micro-leaf, for me at least, is the nice balance of not quite being as mushy feeling as a normal leaf switch, but not as mechanical or clicky as a micro switch....and hey are still fairly quiet too. Pinball FX2 tables are on sale most 75% off but a few are 25% and 50% off. Only tables/packs not on sale in some form are "Balls of Glory" which is Archer, Family Guy, Bobs Burgers, and American Dad! (its $9.99) , Plants Vs Zombies (its $2.99) and the just released "Marvel's Women of Power" pack which is 2 tables for $6.99. Thought this might interest you. It's a demo of DOFLinx for Future Pinball. This provides FULL feedback for tables that have been modded for DOFLinx. This means that now your can use Led-Wiz, Sainsmart USB, Pacled 64, or KL25Z. 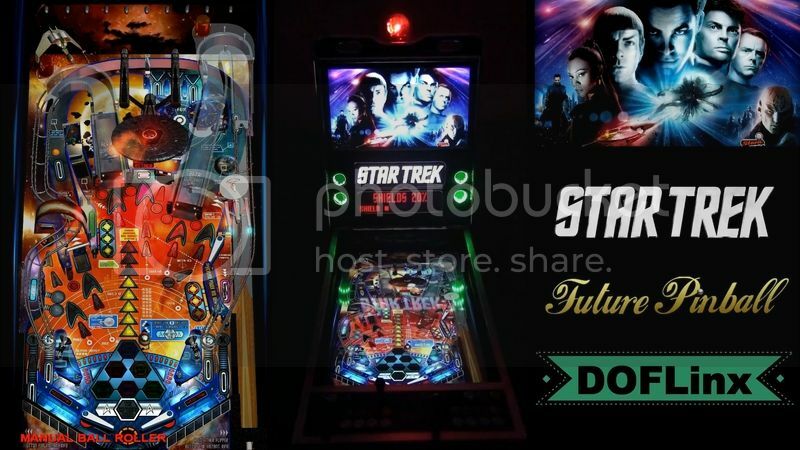 I modded SLAMT1LT's Star Trek Ultimate Edition for full DOFLinx feedback, which means that you can play it in your cabinet. Here's a demo of the table. So, I got some new guts for Ginger. Its a Gigabyte Z77N-WIFI motherboard paired with a 2550K ivy-bridge i5 3.4Ghz CPU 4GB DDR3 RAM and replacing the GTS450 with a GTX560Ti , the other thing carrying over from the old rig is the SSD drive. In the pic above the video card is an GIGABYTE R9-390 Windforce G1 Gaming (8GB) , but I didn't feel like having a bunch of video adapter cables so I plucked the 560 off the shelf. So I pulled everything out, drew wiring diagrams and labeled everything as best I could. I figure, I made it work once, I can make it work again even if I mislabel something. Onve thing I really hated about the old wiring (other than how messy it is) is that I used red and black for both power and ground. I'm going to rectify that mistake! Side note, I used a metric ton of lath screws! BUt Im not quite sure how to run a "beam" for the 3 rear solenoids (for the pop bumpers) or how/where to mount the solenoids if I don't run a beam. I did have 14 gauge wire before , this time I cut wires off a cheapy eBay JAMMA loom. There are other surprises too, but I'll get them more complete before spoiling anything. Re: Gingerballs, backglass and DOF feedback! now with new guts! Lath screws are the best! Looking great! Glad you didn't burn it with fire after all. Can the new PC run Gauntlet Legends 100%? Definitely , the old one could and this one is better. Part of me is considering building a tiny stand alone stick that will plug into the back for some MAME action but that'd be more to make the cab easier to sell rather than make use of it. This pin is my only "emulation cabinet" , my other "Multis" are hardware. Darksoft CPS2, 96 in 1 Pacman, and soon Darksoft NeoGeo. learned a very valuable lesson last night. Test new hardware before pulling the hardware out of your existing project. Your tiny pincab looks really great!!!!!! Nice pinball build, what are the size of the monitors? Yeah 21" and the other one? Good news, my buddy Bobby aka HoBoJoe dropped off a swell motherboard replacement for me. The price was right, FREE! Still need to finish the rewiring but I can see the light at the end of the tunnel. My OCD is much more tolerant of how its wired so far, so that's good. Also have a more efficient CPU cooler in place, and better air flow over all. This i5 seems to run everything as well as the i7 870 did. After looking at your threat i am more and more thinking to build one like the size like you did. It will be my first pinball cab build. I build allready a replica donkey kong cabinet (mala frontend) and a vewlix replica(xboxone). Will it be hard for me to build a pinball? Does the second replacement motherboard run Castlevania Legends 100%? nothing to it but 2 boxes.